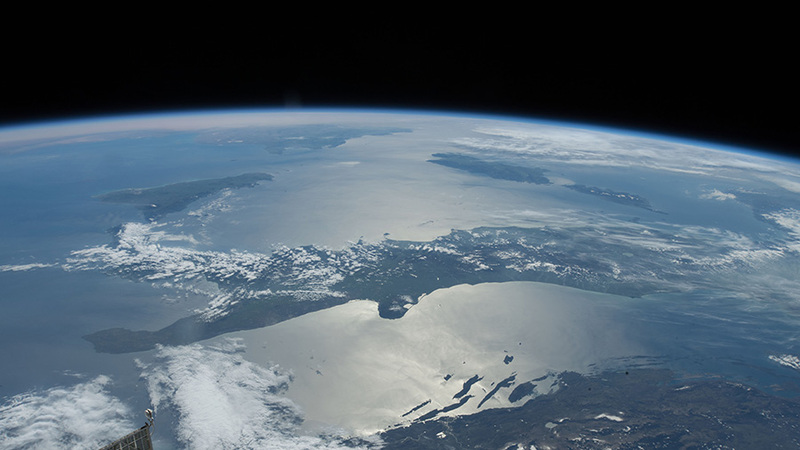 This oblique view taken above southeastern Europe looks west over Italy and into the Mediterranean Sea toward France and Spain. The fully-staffed Expedition 55 crew worked throughout the International Space Station today exploring how microgravity affects a variety of phenomena including biology and physics. The six long-term space residents also practiced a simulated emergency today to maintain their safety skills and awareness. Flight Engineer Drew Feustel started Tuesday collecting a urine sample and stowing it inside the Human Research Facility’s (HRF) science freezer for later analysis. Shortly afterward, Japanese astronaut Norishige Kanai inserted a dosimeter and biological samples in the HRF’s freezer to research the effects of cosmic radiation on mammalian reproduction. Commander Anton Shkaplerov swapped manifold bottles inside the Combustion Integrated Rack, a device that enables the safe observation of flames and soot on the orbital laboratory. Shkaplerov’s work today is in support of the Advanced Combustion Microgravity Experiment (ACME). ACME is a set of five independent studies researching gaseous flames in space that may enable more fuel efficient and less polluting technologies on Earth. NASA astronaut Scott Tingle unpacked new medicine for the crew from the SpaceX Dragon resupply ship today. He also packed up and stowed expired or unused medicine back inside Dragon for return and disposal back on Earth. The entire crew got together in the middle of the day and trained for the unlikely event of an emergency aboard the orbital lab today. The four astronauts and two cosmonauts practiced communication coordination and familiarized themselves with the location of response areas and safety gear. Meanwhile, robotics flight controllers are remotely swapping Pump Flow Subassemblies on the outside of the station. They are removing a spare launched on Dragon and replacing it with a failed unit on the Port 6 truss. This is the first of a series of maneuvers that will culminate with another swap of components during the next spacewalk in mid-May. New researches are path to future. Cheap flights and suitable accomodation in outer space will be our future. Keep up the good work.